The following is a brief description of some of the key ingredients commonly added to energy drinks. Some brands like to emphasize the inclusion or quantity of some of these ingredients, while others tout their absence (Cheetah PowerSurge, for example, markets itself as a "caffeine-free source of energy"). Caffeine is a central nervous system (CNS) and metabolic stimulant, which has the effect of temporarily warding off drowsiness and restoring alertness. It is the world's most widely consumed psychoactive substance, with 90% of adults in North America consuming caffeine daily. Caffeine is found in the leaves and beans of the coffee plant, in tea, yerba mate, and guarana berries, and in small quantities in cocoa, the kola nut and the Yaupon Holly. 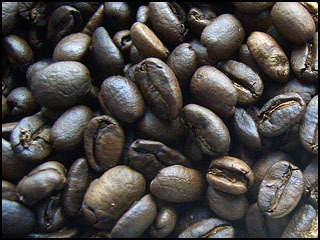 The world's primary source of caffeine is the coffee bean. Caffeine stimulates the central nervous system first at the higher levels, resulting in increased alertness and wakefulness, faster and clearer flow of thought, increased focus, and better general body coordination, and later at the spinal cord level at higher doses. This explains the widespread inclusion of caffeine in most energy drinks, which are heavily marketed to students and IT workers, who often try to pull all-nighters studying or working on a project. Caffeine must be listed on a product's label. Most energy drinks contain between 70 and 200 mg., comparable to a 5 oz cup of coffee, which contains 110-150mg for drip, 65-125mg for percolated, and 40-80 mg for instant. Soft drinks typically contain about 10 to 50 milligrams of caffeine per serving. Dr. Pepper gives you 61mg, and a can of Coke provides 50mg. In contrast, a full can of Rockstar has 150mg. Taurine is an acidic chemical substance found in high abundance in the tissues of many animals, especially sea animals. It is a "conditionally essential" amino acid and is a common ingredient in many commercial energy and sports drinks. Taurine acts as an antioxidant and has been shown to promote detoxification by binding together with harmful substances and thereby accelerating their excretion from the body. Normally sufficient amounts of taurine are produced in the human body, but it is thought that in some situations or under certain conditions (e.g. situations of high stress or physical exertion), increased amounts of taurine are eliminated from the body and cannot be replaced by the body in sufficient amounts, in which case a supplement may help. 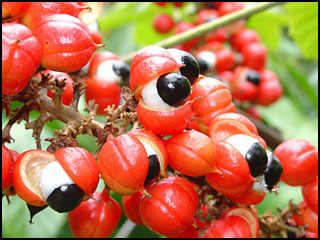 Guarana is a shrub or small tree in the Sapindaceae family, native to Venezuela and northern Brazil. The seed of the Guarana fruit contains caffeine (sometimes called "guaranine") which is a central nervous system stimulant with thermogenic (body fat-burning) and diuretic properties. Guarana is commonly used as an ingredient in energy drinks, as well as in some soft drinks and separately as a dietary supplement to promote health and weight loss. Brazil produces several brands of soft drink from guarana extract that contain no added caffeine. Each differs greatly in flavour; some with very little natural guarana fruit taste. Energy drinks containing guarana include: 180, Rockstar, SoBe No Fear, Bawls, AMP, Monster, Crunk!!! and Full Throttle. B Vitamins are a complex of eight water-soluble vitamins which are active in cell metabolism. The B vitamins often work together to deliver a number of health benefits to the body, including bolstering metabolism, maintaining healthy skin and muscle tone , enhancing immune and nervous system function and promoting cell growth and division. Together, they also help combat the symptoms and causes of stress, depression, and cardiovascular disease. All B vitamins are water soluble, and are dispersed throughout the body. They must be replenished daily, and taking a daily multivitamin with B complex can easily meet this need. Theoretically, the addition of B vitamins to energy drinks may also help meet this need, and any excess will simply be excreted in the urine. According to Traditional Chinese Medicine (TCM), Ginseng promotes Yang energy, improves circulation, increases blood supply, revitalizes and aids recovery from weakness after illness, stimulates the body. But as with herbalism in general, ginseng's medical efficacy remains controversial. 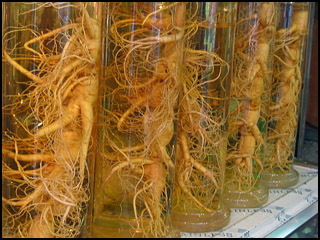 It has been difficult to verify the medicinal benefits of ginseng using modern science, as there are contradictory results from different studies, possibly due to the wide variety and quality of ginseng used in studies. One of ginseng's most common side-effects is sleeplessness. Ginkgo Biloba is a unique tree with no close living relatives. Out of the many conflicting research results, there seem to be basically three effects of Ginkgo extract on the human body: it improves blood flow to most tissues and organs; it protects against oxidative cell damage from free radicals (and is thus an "antioxidant"); and it blocks many of the effects of platelet aggregation and blood clotting that have been related to the development of a number of cardiovascular, renal, respiratory and Central Nervous System disorders. Ginkgo is commonly added to energy drinks, but the amount is typically so low it does not produce a noticeable effect, except perhaps via a placebo effect from Ginkgo being listed on the label.